Lantern has been at 423 W Franklin St in Chapel Hill for nearly 10 years. It’s an award-winning restaurant that’s “a marriage of Asian flavors and North Carolina ingredients sourced mainly from local farms and fisheries.” The Reusing’s execute this menu crazy-well and I’d recommend it anytime. But this is not a food blog. 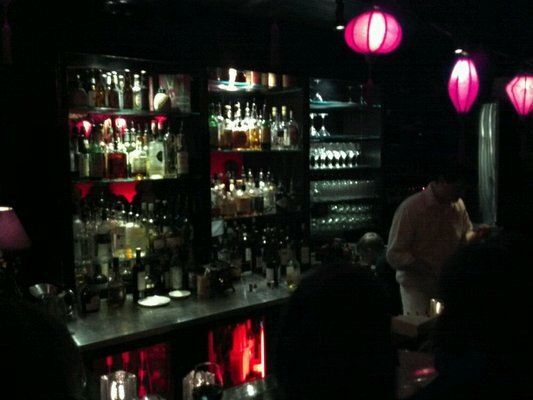 Lantern’s bar is a tiny space with its own, unmarked, barely lit entrance off of the alley next to the restaurant. And when you enter, you’re greeted with a dim and windowless yet vibrant bar that is not too quiet when empty and not too loud when full. The lighting (asian-themed paper lanterns) borrows from the restaurant’s theme. It’s a better-executed version of Rosie’s Bar in M*A*S*H.
The bar takes up almost half the space and I recommend you sit at it. But there are small tables scattered around the reminder of the area, with a comfy wall bench serving the tables on one wall. If that’s more your speed. They serve the full menu in the bar, so if you go for drinks and change your mind about food you don’t have to move. Lantern is not Fox – Lantern is more of a ‘standard’ well-run bar. They have a short, varied, high-quality cocktail menu filled with variations on a number of classic cocktails. The Junebug is an accessible variation on a Pimm’s Cup and the Homeward Angel is a great Manhattan. They even serve a Dark and Stormy with Blenheims — classic. But this is no craft cocktail joint. And I like that. Fox is awesome when you’re in the mood to seriously contemplate what you’re drinking. Lantern is equally awesome if you’re looking for a fun place to hang out with friends, meet new people, and know that you’re getting a quality cocktail while you’re at it. ONE FOOD NOTE: In either the bar or the restaurant, order the persimmon pudding for dessert. Trust me on this one. This entry was posted in Uncategorized and tagged cocktail, Manhattan, Root. Bookmark the permalink. If you’re considering a “Part 3” to “Local Watering Holes”, don’t forget about The Crunkleton in Chapel Hill for a little fun with craft cocktails. If you’re lucky, Gary will be there and will be on his game.